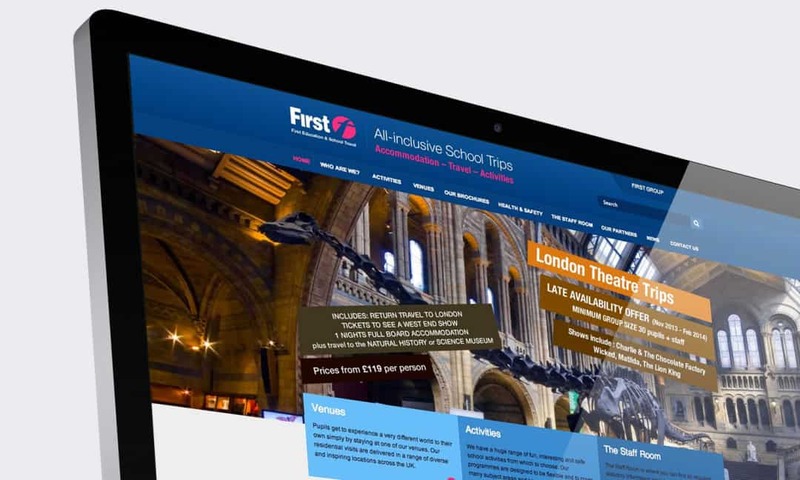 First Education & School Travel have been providing travel inclusive high quality, low cost trips for schools and groups for around 4 years. We offer various curriculum based themes for Key Stages 1-3. First Education & School Travel is part of the First Group of companies, the U.K’s largest surface passenger transport company carrying 2.7 million passengers everyday. Our hugely experienced School Travel team offers a one-stop shop for schools and group leaders looking to plan a residential school trip or day visit. We were exclusively appointed by UK leading British transport organisation First Group to design, develop and build a new interactive website for their First Education and School Travel sector. First Group wanted a website that would primarily act as a shop window within which they could display their range of products and services. Secondary to this First Group wanted to emphasise their strengths in key aspects of trips and trip planning. To provide a unique platform to showcase their business and products and to highlight industry leading unique selling points. To celebrate the launch of the new website, First Education & School Travel also commissioned a bespoke mailing device to be included in the next First Education & Travel mailshot. While remaining true to the overall design of the new website, the mailer includes details of how to win an ‘all-expenses paid Free School Trip’. First Group are thrilled with the end results, as are we – the look and feel of the website is fantastic and the simplicity of the navigation offers users a relaxed and enjoyable experience. We are really looking forward to developing our relationship with First Group and cannot wait to start on their next project.